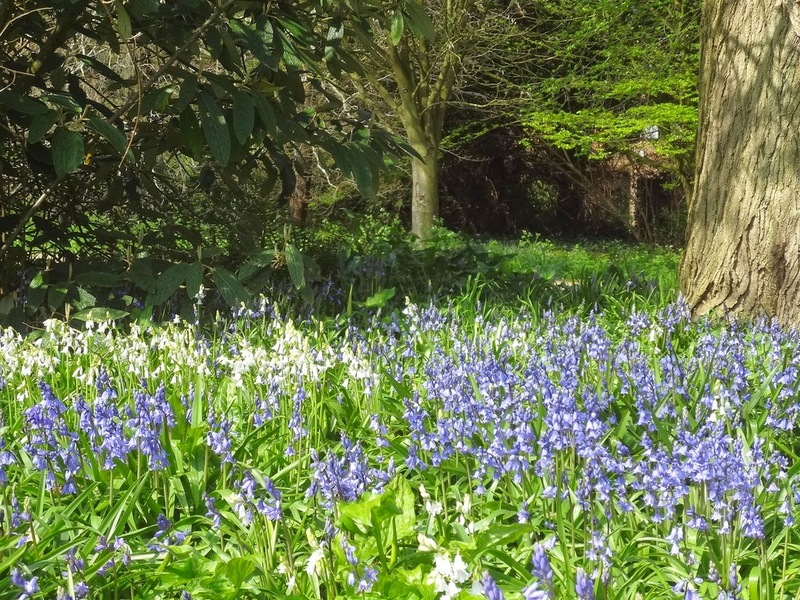 So says a famous Middle English love poem, telling us that April and nightingales, spring and love have long been almost synonymous with each other. 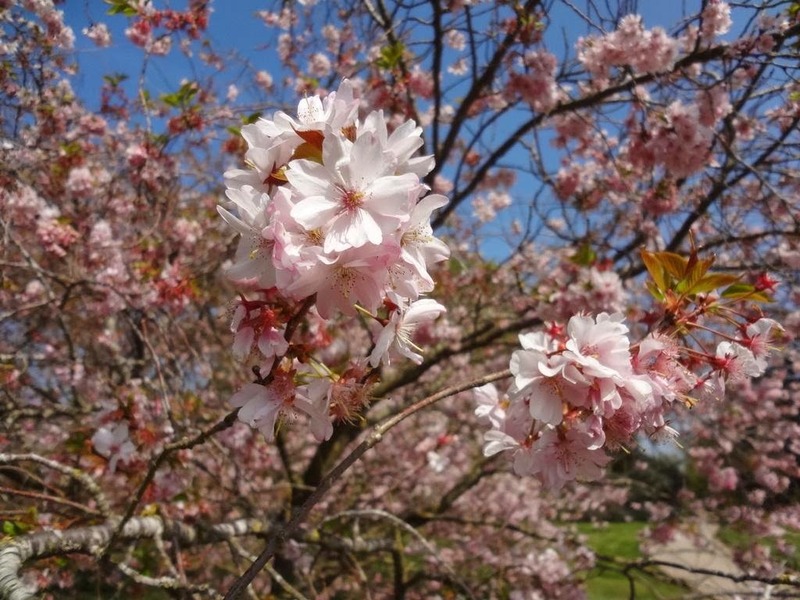 In the following extract from the thirteenth-century debate poem The Owl and the Nightingale, the nightingale prides herself on bringing bliss with the coming of the spring - apt reading for the last days of April. Then you sing from eve til morrow. The more I sing, the more I may. Too much pleasure makes men sad. Away I fare - and wise I am! I don't care a bit for winter's grief! Because I worked here for their sake." This poem is a debate, so of course the owl has a riposte: winter's the time when people need music the most, she says, and so she sings carols to cheer and comfort them. And she takes the war into the enemy's camp by accusing the nightingale of going around kindling shameful thoughts of love and lust in the spring. 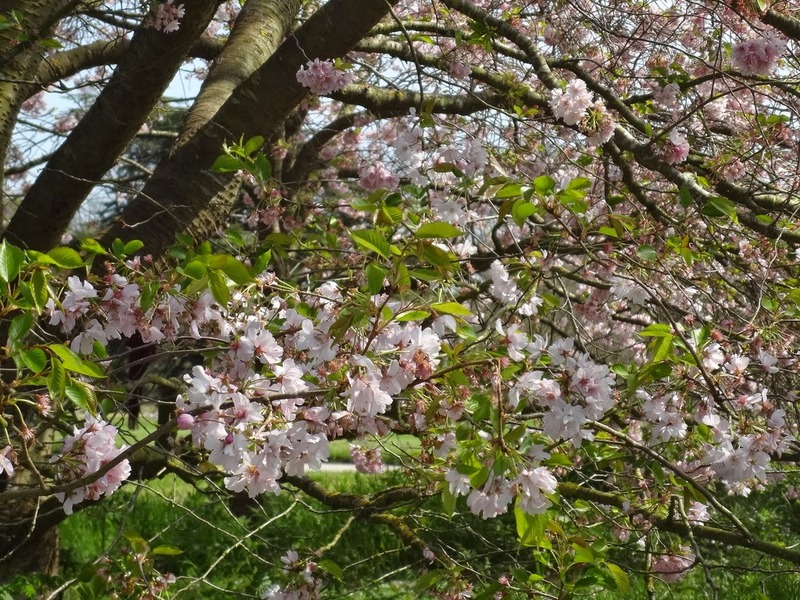 But on an April day, our sympathies are probably with the nightingale. 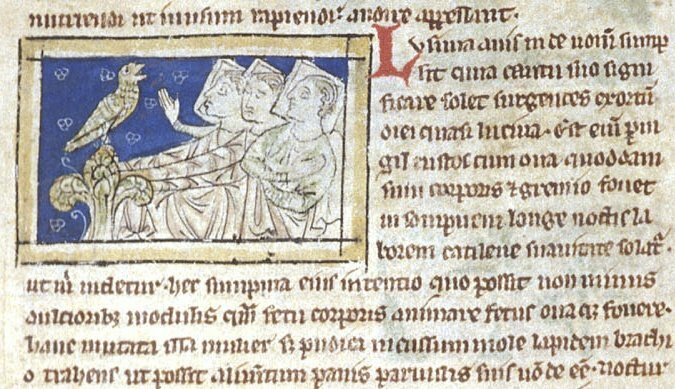 I've just written another blog post for the BBC History website, History Extra, about the various fates which befell the bodies of Anglo-Saxon kings after death - you can read it here. This was inspired, of course, by the recent reburial of Richard III (well, by that and slogging through William of Malmesbury's De Antiquitate Glastoniensis Ecclesiae, from which the first story comes). 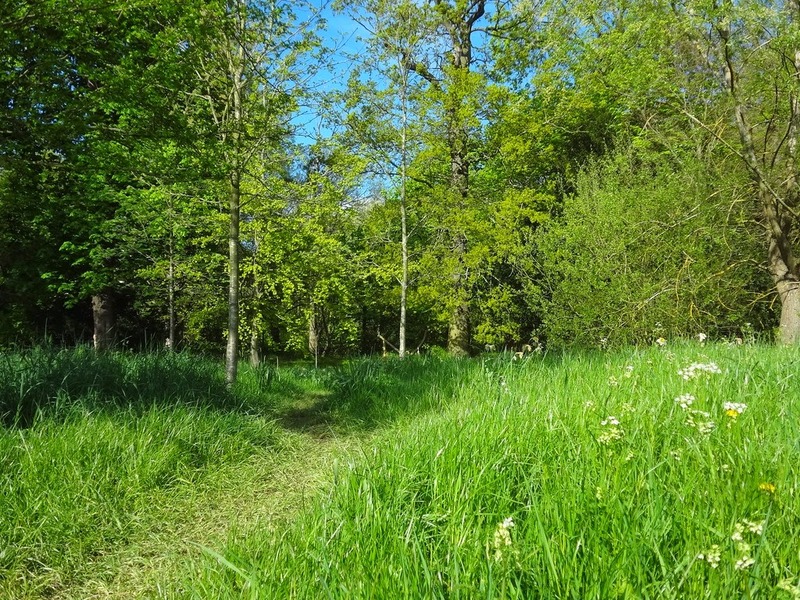 If you're interested in that particular subject, I wrote about the similarities between Richard's reburial and medieval translation narratives here. Numerous aspects of this topic interest me, beyond the rather gruesome facts of the burials themselves. The details can be illuminating: William of Malmesbury's story probably suggests an incipient cult, never brought to fruition, of King Edgar at Glastonbury, while the treatment of Svein and Æthelred's bodies amid the exigencies of wartime is a reminder of just how dangerous England was in 1014-16. Going further back, I find it fascinating - living now in an age when London dominates all - to think about the decentralised world of Anglo-Saxon kingdoms, the days when Bedford or Malmesbury or little Repton could be places of royal significance. Winchester was a royal capital long before Westminster had an abbey, much less a parliament - when it was just a thorn-covered island in the Thames. St Augustine's Abbey in Canterbury was once a royal mausoleum, where for nearly a millennium the first English Christian king lay in an honoured tomb; the abbey is now in ruins, the tomb vanished. And this is only Anglo-Saxon England, well-documented and relatively modern history, which feels like yesterday compared to landscapes like Stonehenge or Wayland's Smithy, the eald enta geweorc which were ancient to the Anglo-Saxons themselves. It's a tantalising glimpse at a lost, enchanted landscape, a reminder that however inevitable and natural the current state of things might seem to us, the geography of power changes - and will change again, some day. This is a romantic way of thinking about history but it can be a salutary one, a poetic strain more starkly challenging than the most sober facts. What really interests me about the varying fates of kings' bodies is the philosophical lesson which any medieval historian would have been ready to draw from such stories: earthly power is fleeting, and all empires fall. (Henry of Huntingdon is particularly good on this subject.) This is, in one way, too obvious to be worth saying, but at the same time - especially since we in the UK are in the middle of an election campaign - it can't be said often enough. These days it's possible to eavesdrop on the most powerful in our society, people who consider themselves opinion-formers, as they talk to each other within the screeching and self-regarding echo chamber of Twitter; there, every moment's crisis is the most important thing which has ever happened, and they don't even know how little they know about the lives of the people they think they govern. The perspective of five years seems beyond most of them, let alone five hundred. A little more philosophy would do us all a lot of good. Medieval literature has many profound things to say about power and its limitations, which speak to a world in which we are not good at conceptualising the parameters of our own importance. Ubi sunt qui ante nos fuerunt?, the question asked by so many medieval poems, is a cliche only because it is so important and so self-evidently true. Tell me, where is Solomon, at one time a king rich? The English translation of Boethius' Consolation of Philosophy written for (or by) Alfred the Great famously asks, replacing Boethius' Fabricius with a native hero: 'Where now are the bones of Wayland, and who knows where they now may be?' We can ask the same question about the bones of Alfred, as Alfred himself might have expected us to do; but it's a philosophical, not an archaeological, question - an invitation to meditate, not to dig up Hyde Abbey. It's not hard to imagine modern equivalents for those medieval Doomsday scenes where the naked dead, facing judgement, bear some token of their power in life - like the above from Wenhaston. Replace those little hats with whatever signs would be most appropriate for modern power: Prime Ministers, bankers, advertisers, celebrities, whatever you like - it all comes to the same thing in the end. This medieval focus on death and mortality, which to a modern audience may seem morbid, can in fact be radically liberating. It's both humbling and empowering: your own actions may be nothing, your age a blink of an eye, in the incomprehensibly long history of the world, but freedom from the constraints of your own time liberates you to ask big questions, to act in whatever way you think will do most good in the little space allotted to you. It's those who have contempt for the world (in the old sense of contemptus mundi) who are most free to improve it, being least in thrall to its chains of success, wealth and power. A memento mori is not morbid if it encourages you to value what is lasting over what does not endure. This lesson is especially poignant when knowledge of it is attributed to kings themselves, and I don't think it's a coincidence that two of the best-known stories about Anglo-Saxon kings relate to this very moral: King Alfred, the thoughtful reader of Boethius, being reminded at his lowest ebb that to a woman baking cakes a king is no better than any other man; and Cnut, the great Viking who could rule the seas but could not control the tide. The idea is perhaps most powerfully expressed in the completely unhistorical but nonetheless haunting legends surrounding the idea that Harold Godwineson might have survived the Battle of Hastings, about which I wrote here. Those stories, inspired by a terrible injustice, are wish-fulfillment fantasies about how things could or should have been, a lament for a lost king and a lost country. But they don't describe Harold returning in battle to reclaim his conquered kingdom; the wish being explored is not violent or vengeful. Harold becomes a hermit, and his loss of earthly power gives him unique spiritual insight - a humiliation better than any glory and a wisdom greater than any crown. Hath in 't more value, though less seen. And reckoned peace my choicest gem. My joys were meadows, fields, and towns. Or worldly pelf that us destroys. More fools at twenty years than ten. And hobby-horses brought to prize. His soul was quickly murthered. I lost, my joy turned to a blaze. As part of the burgeoning social media empire with which I daily attempt to entertain and educate a grateful public, I run a Twitter account of quotations from the works of Thomas Traherne. (Yes, I know - but people do seem to like it.) Pithy Traherne is eminently tweetable, and I take comfort in the thought that when I can't write anything worth reading, I can at least share other people's wisdom. I'm currently tweeting my way through this poem, 'The Apostasy'. If nothing else, it's good for me to get a daily dose of Traherne's philosophy; it puts everything else into a healthier perspective - as this poem did for me today. Then, on the Tuesday evening, when he could no longer speak words which could be understood, he was asked by Ralph, bishop of Rochester, to give his absolution and blessing to those of us who were present and to his other sons, and to the king and queen and their children, and to the people of the land who lived under his authority subject to God. He raised his right hand as if nothing was wrong with him, and, after making the sign of the holy Cross, he sat with his head bent down. Now, when the community of the brethren was singing lauds in the morning in the main church, one of us who were with him took the copy of the Gospels and read to him the account of the Passion which was appointed to be read at Mass on that day. And when he came to the words of the Lord 'Ye are they which have continued with me in my temptations; and I appoint you a kingdom, as my Father hath appointed unto me, that ye may eat and drink at my table in my kingdom,' he began to draw his breath more slowly than usual. We felt therefore that he was now on the point of death, and he was lifted from his bed onto sackcloth and ashes. The whole congregation of his sons gathered round him and, sending forth his soul into the hands of the Creator, he slept in peace. And so he passed away as dawn was breaking on the Wednesday before the institution of the Lord's Supper, on 21 April in the year of our Lord's Incarnation 1109, which was the sixteenth year of his pontificate, and the seventy-sixth of his life. There was a certain monk of the church of Canterbury, Elias by name, an upright man endowed with a simple innocency of life. To him there appeared a vision one night almost three months before the death of Father Anselm. He thought that he was standing alone in the church praying as God gave him utterance. While he was thus occupied he looked up, and behold Father Anselm was prostrate in prayer before the tomb of St Dunstan. He saw that, while Anselm was praying, the lid of the tomb began to move so that it was gradually withdrawn from its place. 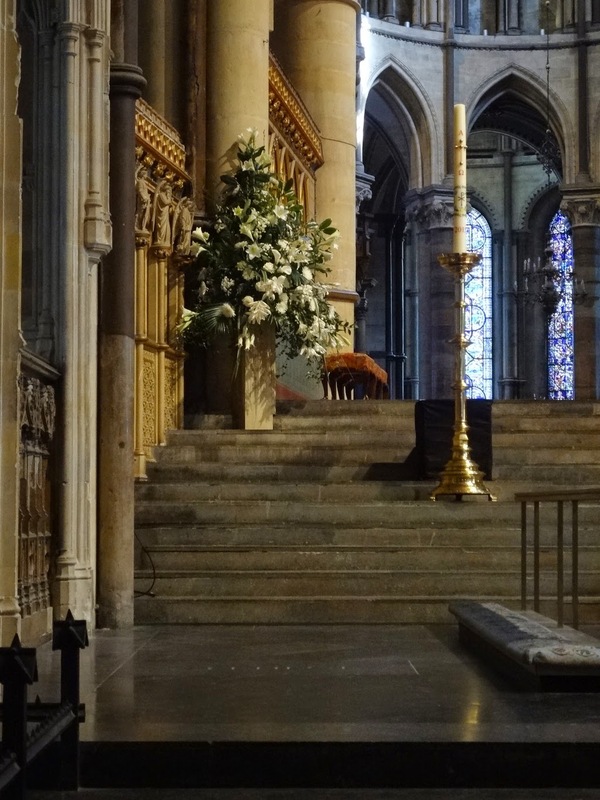 Anselm was disturbed by this movement and, rising from his prayers, he saw St Dunstan raising himself gradually in his tomb as if to sit up; but he was hindered by the lid of the tomb which had not yet withdrawn sufficiently to leave him room for sitting. Anselm tried with all his might to move the weight, but without success. He therefore beckoned to the aforesaid brother, who stood at a distance, to approach and to help him to achieve what he was unable to effect alone. He approached and together they succeeded in doing what one had been unable to do. The brother described this vision to me next day in conversation, but I — being more eager that my Father and lord should live than that he should die — tried at that time to interpret it in a way different from what later fell out. But when it came to the day, it was then clear what the vision had foretold, for as dawn broke on that day the Father was taken from this life and received the glory of a heavenly reward, as another vision which I shall describe made clear. At that same hour when he was to take leave of this life, a certain monk of the neighbouring abbey of the blessed Apostles Peter and Paul and St Augustine, who was anxious about the Father's death, was suddenly overcome with sleep as often happens when we are weary with anxiety. As he slept it seemed to him that he stood near to Anselm in the room where he lay dying, and the room was filled with a host of people most wonderfully and beautifully arrayed in white apparel and seeming to await the arrival of someone who was swiftly to come to them. The company was under the authority and direction of a bishop of outstanding splendour dressed in full pontifical robes, and all awaited his signal. He appeared to go in and out, exhorting those who were outside to watch without fainting. And when Anselm was on the point of death, he went out in haste and said, 'Behold he whom you await is at hand. Receive him, and lead him where the Lord has ordained, with the voice of joy and praise.' While this was taking place, the brother was roused from sleep and knew that father Anselm had exchanged this present for eternal life. It was perfectly clear from his appearance and bearing that the bishop presiding over the others was St Dunstan, who with full honour and glory gave Anselm the ring, which had been promised as we have described. Vita Sancti Anselmi, trans. Southern, pp. 154-6. Today is the feast of St Alphege (Ælfheah), one of the chief saints of Anglo-Saxon Canterbury. Taken prisoner during the Viking siege of Canterbury in 1011, he was held hostage for seven months before being killed by his captors at Greenwich, apparently because he would not (or could not) pay a ransom for his freedom. The Anglo-Saxon Chronicle says the army, drunk on 'wine from the south', took the archbishop to their husting and pelted him with bones and ox-heads, until one of them killed him with an axe-blow to the head. He was buried at St Paul's in London, but his body was returned to Canterbury in 1023, with royal ceremony provided by Cnut and Archbishop Æthelnoth. I've posted about St Alphege several times before, at greatest length here, so today I thought I'd just post the famous discussion which Lanfranc and Anselm had about him in the 1070s, as recorded in Eadmer's Vita Anselmi. It makes a nice contrast to the conversation between Lanfranc and Anselm which featured in my last post (that wasn't intentional, actually). Twenty years on, Lanfranc was by now Archbishop of Canterbury, and Anselm was abbot of Bec; the young Anselm of that story - uncertain about his future, puffed up with youthful pride, seeking Lanfranc's counsel - was now someone Lanfranc himself would ask for advice. This is from Eadmer's Vita Sancti Anselmi, ed. and trans. R. W. Southern (Oxford, 1972), pp. 50-2. The things which were said and done in those days between the reverend prelate Lanfranc and Abbot Anselm will require no explanation to those who knew the lives and habits of both; but those who did not know them may form some idea from the fact that - in my opinion and that of many others - there was nobody at that time who excelled Lanfranc in authority and breadth of learning, or Anselm in holiness and the knowledge of God. Moreover Lanfranc, as an Englishman, was still somewhat green, and some of the customs which he found in England had not yet found acceptance with him. So he changed many of them, often with good reason, but sometimes simply by the imposition of his own authority. While, therefore, he was giving his attention to these changes, he had Anselm with him, a friend and brother with whom he was of one mind; and talking with him informally one day, he said, 'These Englishmen among whom we are living have set up for themselves certain saints whom they revere. But sometimes when I turn over in my mind their own accounts of who they were, I cannot help having doubts about the quality of their sanctity. Now one of them lies here in the holy church over which by God's will I now preside. He was called Elphege, a good man certainly, and in his day archbishop of this place. 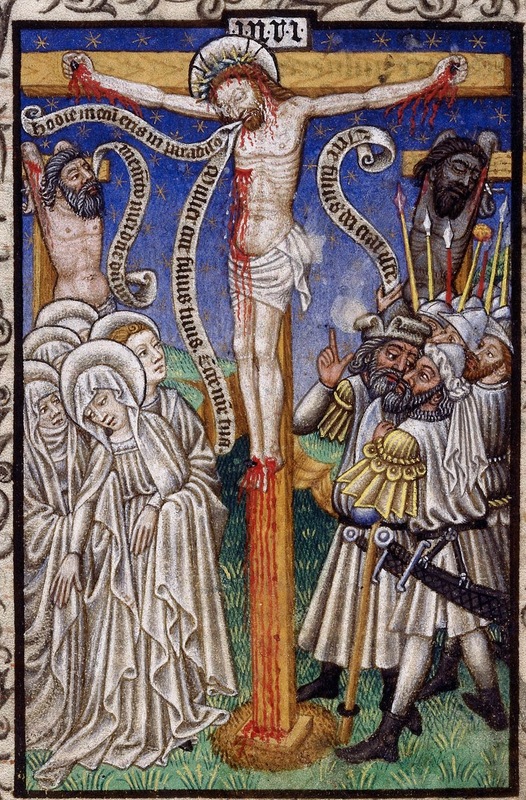 This man they not only number among the saints, but even among the martyrs, although they do not deny that he was killed, not for professing the name of Christ, but because he refused to buy himself off with money. For - to use the words of the English themselves - when his foes, the pagan enemies of God, had captured him, out of respect for his dignity they gave him the possibility of buying himself off, and demanded in return an immense sum of money from him. But since he could only have obtained this by despoiling his own men and possibly leave them to a wretched state of beggary, he preferred to lose his life rather than to keep it on such conditions. Now, my brother, I should like to hear what you think about this.' Thus, talking as a recent citizen of England, he briefly outlined the case and submitted it to Anselm. If, however, we look on the matter historically, we see that this was not the only cause of Saint Elphege's death, but that there was another and more fundamental one. It was not only because he refused to buy himself off with money, but also because like a Christian freeman he stood out against his pagan persecutors, and tried to convert them from their infidelity, when they were burning the city of Canterbury and the church of Christ which stands there, and when they were putting the innocent citizens to a horrible death - it was for this that they seized him and put him to death with cruel torture. This is a valiant effort to put Alphege's death back into its historical context, as part of the two-decade catalogue of miseries which England had suffered in the years before the archbishop was murdered. 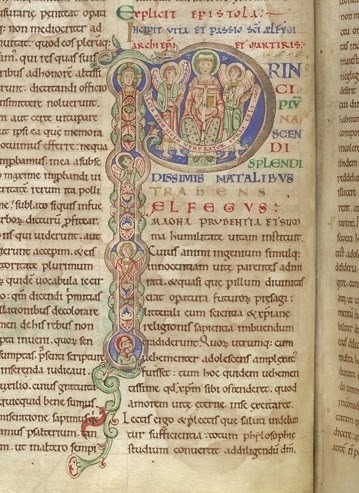 The disasters of Æthelred's reign culminated in the siege and burning of Canterbury, and the Anglo-Saxon Chronicle and Osbern's account of Alphege's death both talk about the events of 1011-12 as twin disasters, the destruction of the city and the death of the archbishop together comprising a turning-point in English history. Osbern says 'Each singly would have been calamity enough to the kingdom – either the harm done to the priest or the deadly destruction of the city – so that deprived of either glory England would never from that time on regain her former status'. In this view of things Alphege's death was less about the payment of ransom than a symbolic blow at England's Christian identity, in the city (as the Chronicle says, speaking for 'us' the English) þanon com ærest Cristendom 7 blis for Gode 7 for worulde, 'from where there first came to us Christianity and joy before God and before the world'. The lurid nature of Alphege's death makes it easy (for many modern readers, and maybe for Lanfranc too) to see it as simply the product of a barbaric age, in which the English were not much better than their Danish attackers. 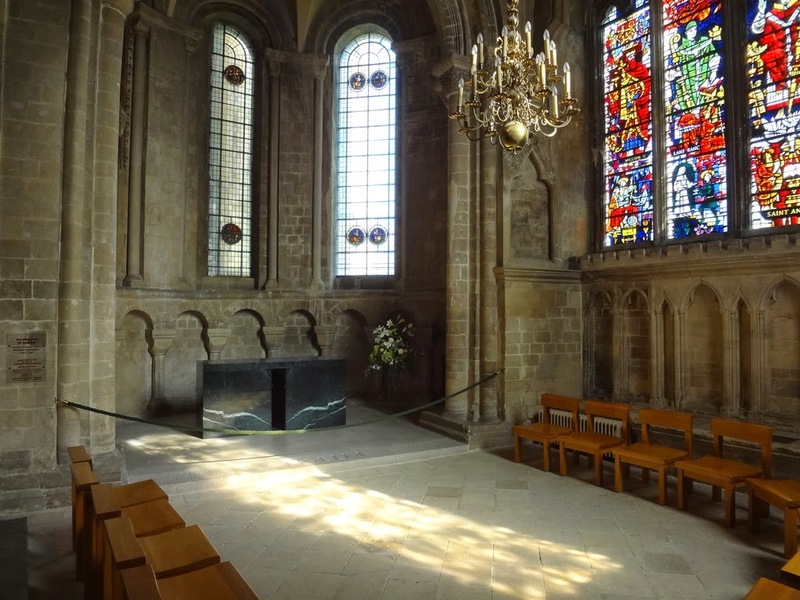 In Lanfranc's eyes, the pre-Conquest church of Canterbury (which he had first encountered in ruins) probably did not seem all that much to boast of. 'But if we look on the matter historically', through the eyes of a historically-aware English monk, Canterbury and its church were the very symbol of English Christianity, their destruction a mark of decline - the end of all the spiritual, artistic, intellectual, and literary richness which characterised the Anglo-Saxon church in its prime. It was for that church and its people that Alphege died. And this he afterwards faithfully carried out, and even ordered a careful history of his life and passion to be written. 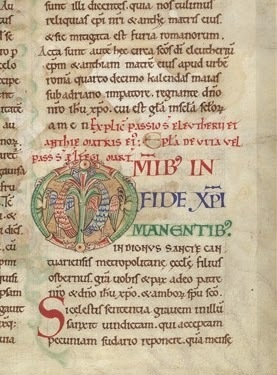 This history was nobly written at his command by Osbern, a monk of Canterbury, of happy memory, who wrote it not only in plain prose for reading, but also put it to music for singing; and Lanfranc himself for love of the martyr gave it the seal of his eminent approval, authorized it, ordered it to be read and sung in the Church of God, and in this respect added no small glory to the martyr's name. I wrote about Osbern's work on Alphege at length here; it is indeed 'nobly written'! So Alphege remained (with St Dunstan) one of Canterbury's most venerated saints, the two of them being joined by Thomas Becket at the end of the twelfth century. Though Becket's saintly fame has since greatly overshadowed his predecessor's, contemporaries were more likely to link than to contrast the two; Becket compared himself explicitly to Alphege in a sermon he preached a few days before his death, and I posted here about an Anglo-Saxon prayer to Alphege which was later repurposed for the new martyr. It's sometimes been pointed out that Chaucer's pilgrims, travelling towards Canterbury, as we are specifically told, around April 18, would have arrived at the city (had they ever got there) on or just after the feast of St Alphege; so they would have had more than one 'hooly blisful martir' to pray to, once they arrived at the cathedral. There are times when studying the past makes modern life seem easier, and times when it makes it seem much, much worse. Sanitation, and life expectancy, and health in general fall into the first category; in the second category comes the process of applying for jobs, which is currently absorbing a large part of my time and energy. (Other things fit into that category too, but I won't start listing them.) When caught up in the humiliations and absurdities of modern job-hunting, it's all too tempting to daydream about living in another time and place: to imagine what it would be like to live in an age when a person might be valued for more than just their career, or to wonder how it would feel not to live your life under constant review, always trying to deal with the prospect of failure and perpetually striving to win the approval of strangers. There's hardly been a month in the past ten years of my life when I haven't been in the process of applying for something - jobs, university courses, research projects, conferences, publications, etc., etc. - and although a good number of those applications have been successful, the success, in retrospect, feels very brief, compared to all the time spent living with the fear of failure; the anxiety of applying and the tension of waiting, plus the inevitable rejections along the way, far overwhelm the fleeting happiness that comes with success. Living like this takes an emotional toll which you're not really allowed to talk about; all those things are opportunities, after all, and you readers (being I know mostly older than me, well advanced in your careers or safely retired) are doubtless shaking your heads as you read this, itching to give me a lecture about how ungrateful I am not to appreciate all the choices and opportunities of youth. (Please, restrain yourselves.) I know choice is a privilege but it can feel like a burden, especially when you have no one to help you with your decisions; and things which look like opportunities are so often just more chances to be weighed down by rejection and fear and guilt. I know I'm supposed to be grateful for all this, but it would be nice to be happy, too, just for a little bit. This insecurity is probably an inescapable part of modern life, and it's not even just the sick state of academia that's the problem, for once; I can't imagine any career I might have that would give me a sense of long-term security, let alone freedom from the feeling of being constantly reviewed, assessed and judged. It's usually better for my peace of mind not to remember that it's such a recent development, that people haven't always lived like this, and there have in the past been societies with healthier attitudes to work and life than ours. But studying the past can provide consolations too; so let me share with you a story which cheers me up when I'm worrying about the career choices in front of me. If you're in a similar case, it might cheer you up too. It's a story from the Vita Anselmi by Eadmer, and it describes a career dilemma which confronted the young Anselm when he was about twenty-six years old. 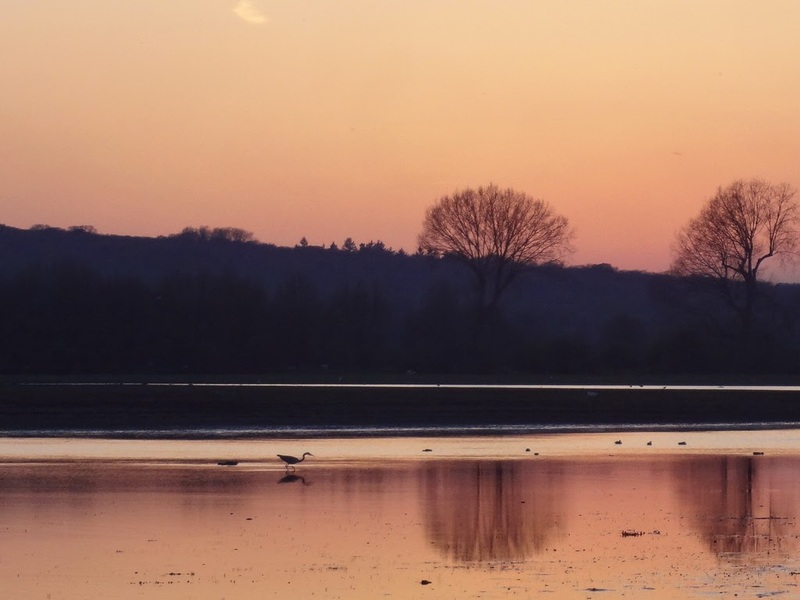 That would have been around the year 1059, and Eadmer's account is based on what Anselm told him more than thirty years later; by that time Anselm was Archbishop of Canterbury, and one of the most respected scholars in Europe. He often used to playfully to recount these thoughts of his [i.e. later in life], and he would add, "I was not yet tamed, and there was not yet in me any strong contempt of the world. Hence when I said this, as I thought, out of love for others, I did not see how damnable it was." A year younger than me. What's rather odd, but endearing, about this story is that Anselm's concerns are very worldly - this is, after all, not just a career choice but a religious vocation, yet he admits he was more concerned with how to use his intellectual gifts (how to 'display my knowledge and be of service to others') than with how to serve God. His unwillingness to stay at Bec because he feared being overshadowed by the famous Lanfranc is a particularly credible detail - very plausible in an embryo scholar, conscious of his gifts but young enough to be anxious about getting recognition! That's part of what makes me like this story so much, and it also amuses me that Lanfranc's reaction is pretty unhelpful (why was he so hesitant in recommending monastic life?). 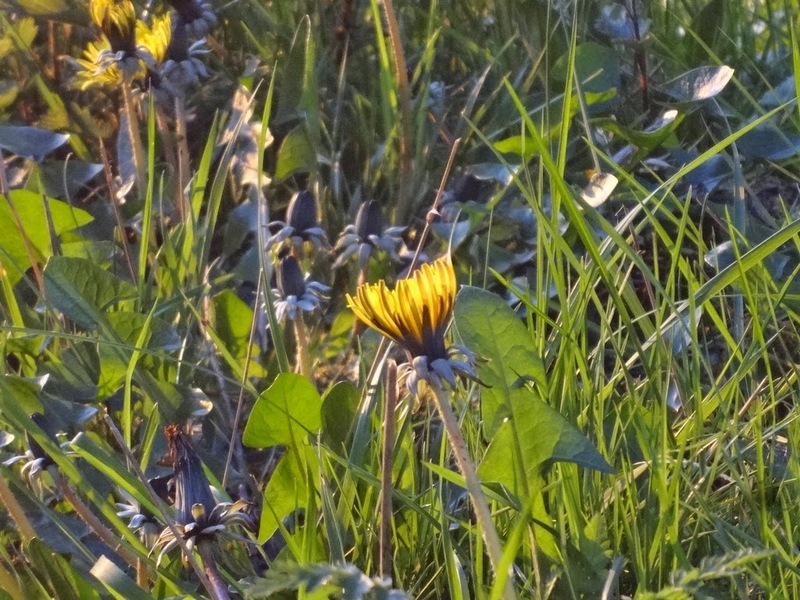 But it's mostly comforting just to hear a story which admits that choice can be difficult. How on earth are you supposed to decide what to do with your life, when the decision appears to be a matter of free choice, but the consequences are so entirely beyond your control? Anselm could never have imagined that his decision at the age of twenty-six would lead him to the position he was in when he told this story - he could never have begun to guess that from being a monk of Bec he would become Archbishop of Canterbury, and would tell this tale to a young Englishman who, not yet born when it took place, would record it for posterity. I wonder what Eadmer made of this story when Anselm 'playfully' told it to him, because it must have been quite alien to his own experience; Eadmer was entered into the monastery at Christ Church, Canterbury, as a child oblate, and never had a moment of choice in his vocation like the one Anselm described. His life was laid out for him by his parents at the age of seven, and he never really deviated from it. (I envy that, a bit!) And I wonder too in what context Anselm told this story. Just as a playful tale against himself? As a warning against boyish arrogance? Or for a kinder purpose? 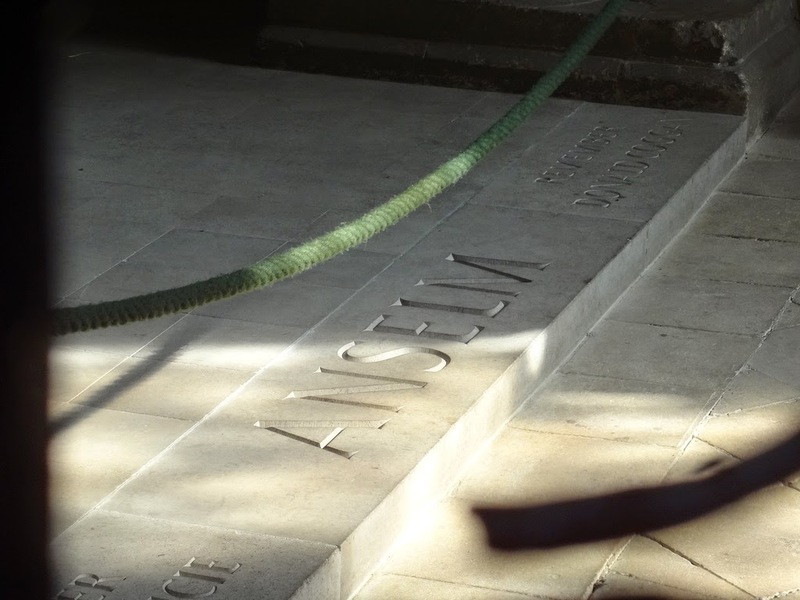 Elsewhere in the Vita Eadmer describes Anselm's humane philosophy of education, his belief that young people need not strictness but "gentleness from others, kindness, compassion, cheerful encouragement, loving forbearance, and much else of the same kind". Telling stories about your own failings can be part of that, of course. The young and inexperienced make such silly mistakes, and those in positions of power often think it's their role to judge and criticise them rather than to show compassion. They demand from their juniors more than was expected from themselves, and are merciless if their impossible expectations are not met; anything less than perfection is failure, and if you find that hard to bear, it must be your own weakness. Imagine if Lanfranc had said to Anselm, as many a powerful person might have done, 'if you don't know what you want to do with your life by the age of 26, I can't help you!' What a difference kindness makes. It would be nice to think that Anselm told this story about himself to encourage the troublesome, restless young monks over whose problems we know he took special care. I always appreciate it very much when successful people tell stories about their youthful errors and failures - I'm sure it takes courage to do so, but it can be immensely helpful. Surely everyone has had times in their life when they worried about what was going to happen to them, but not everyone is prepared to admit it. Sometimes it seems that later in life people forget what it's like to have your future stretching out in front of you, completely unknowable and out of your control; they tend to romanticise it, telling you how lucky you are to have so many choices still ahead of you. Perhaps as you grow older you forget how terrifying that thought can be, how hopeless and lonely it can make you feel. Maybe Anselm was wiser - I'd like to think so. Well, all this is a perfect example of how not to blog while you're applying for jobs and seeking the approval of strangers. I can only post it because I'm currently, for a week or so, between applications, but I think I'll delete this post before I submit the next application. Can't admit to doubt or weakness when someone might be googling you and judging you! The Saturday between Good Friday and Easter Day - between Christ's death and his resurrection - is traditionally considered to be the time of the Harrowing of Hell, when Christ descended into the underworld to free all those who were imprisoned there until his rising from the dead. 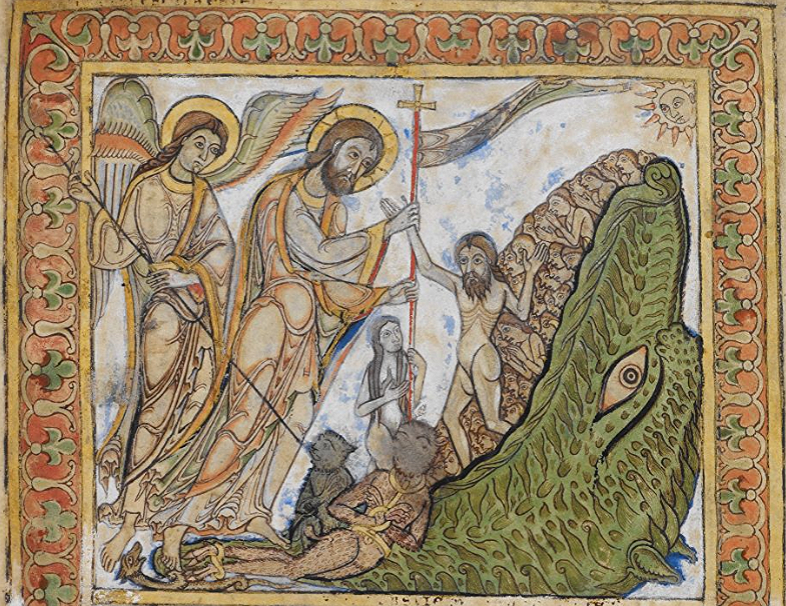 The Harrowing of Hell was a very popular subject in medieval art and literature, and it served as a potent story of liberation: the king of justice storming the prison of evil to set its captives free. Hell oncneow Crist, ðaða heo forlet hyre hæftlingas ut, þurh ðæs Hælendes hergunge. Hell acknowledged Christ when it let its captives out, through the Saviour's harrowing. 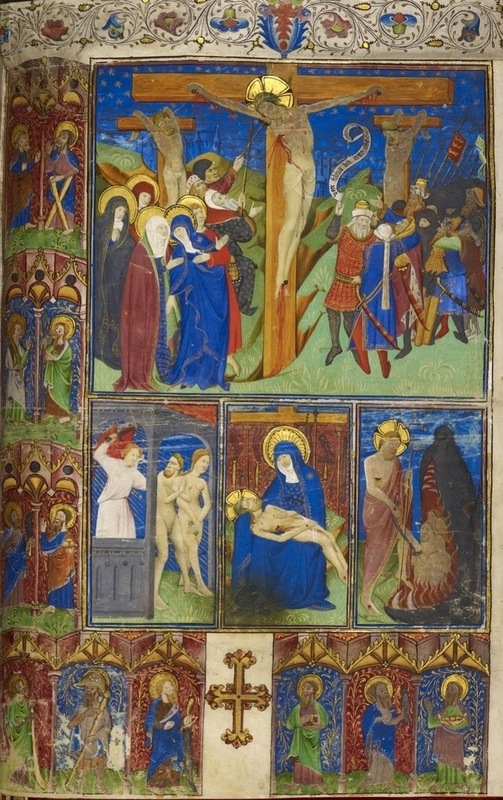 Last year I posted the dazzlingly brilliant section from Piers Plowman which explores the Harrowing of Hell, and today I want to share some extracts from another English poem, four centuries older, on the same theme. It's an Anglo-Saxon poem known as 'The Descent into Hell', which is preserved in fragmentary form in the tenth-century Exeter Book. 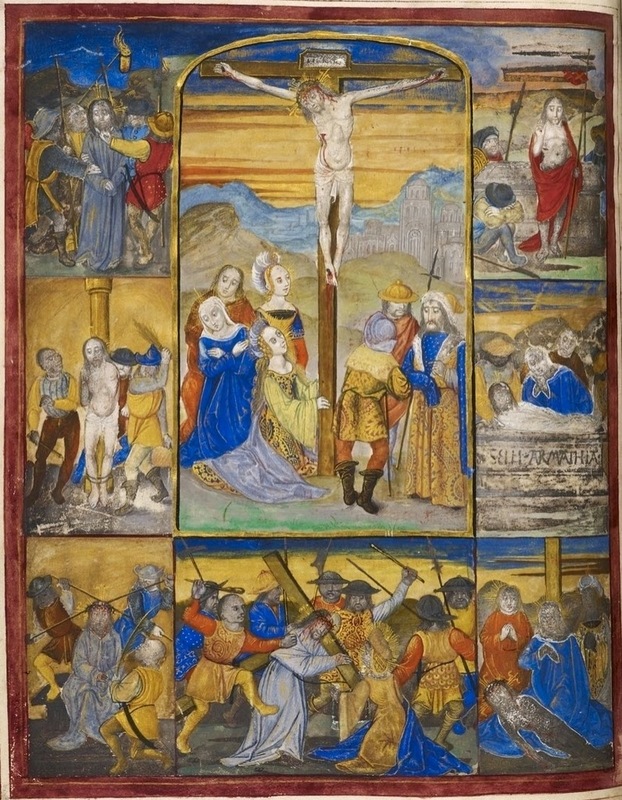 It begins with the women going to the tomb, describing their grief and desolation; then the scene shifts to hell, where all the figures of the Old Testament who lived before Christ rejoice at his coming and John the Baptist speaks a long and eloquent prayer to their liberator on behalf of them all. The text, which is damaged in places, is taken from here, with my translation; a full edition and translation of the poem can be found in M.R. Rambaran-Olm, 'John the Baptist's Prayer' or 'The Descent into Hell' from the Exeter Book (Cambridge, 2014). that the prince's body was enclosed in an earthen tomb. This opening sounds various echoes with other Old English poems. 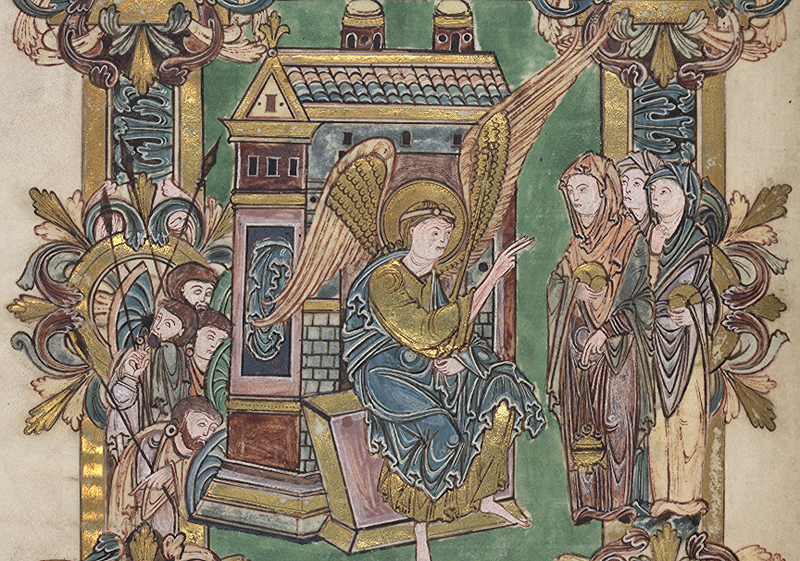 As the women think about Christ lying ænne in þæt eorðærn, 'alone in the earthen tomb', so The Dream of the Rood imagines Christ alone in the tomb as his followers depart: reste he ðær mæte weorode, 'he rested there, with little company'. And the mourning women who go out on uhtan, in the hour before the dawn, could almost be sisters to one of the most memorable voices in the Exeter Book: the woman in The Wife's Lament, who famously says of herself, separated from her lord, that she suffers uhtceare, 'sorrow before dawn'. The word the poem uses for Christ's tomb is eorðærn, an earthen vault, and the woman in The Wife's Lament dwells in an eorðscræfe, an earthen chamber of some kind beneath an oak tree. 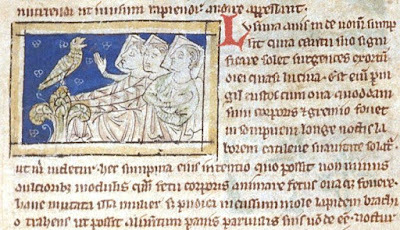 The mysterious plight of the woman in The Wife's Lament has provoked endless discussion, but if you were an Anglo-Saxon monk reading this manuscript, I wonder whether you would see any parallel between her and seo murnende Maria on dægred 'Mary, mourning at day-break'. Then the Lord of mankind hastened to his journey. most righteous of all kings. the barriers from the city, and the king rode in. many virgins, countless numbers of people. the mourning man perceived the journey of God himself. shrouded in darkness. The thegn was full of joy. now we are languishing in these bonds. that he will release him from his bonds. wise in your wits and perceptive in your words! God's word speak from his own mouth. have mercy upon us, Maker of mankind! have so often shown, when they were in need of grace. the sands of the sea, best of all Kings. O synfull man, geve me thyn hert. O synfull man, yeve me thyn hert. And for thy sake shedde my hert blode. What I haue done and do for the. This is another poem from CUL MS. Ee 1.12, which in that manuscript follows the two 'Nolo mortem peccatoris' poems and precedes 'O man, whiche art the erthe take froo'. The speaker is, of course, Christ, and the refrain, 'revert' is perhaps supposed to echo Isaiah 44:22: 'Return to me, for I have redeemed you'. O sinful man, give me thine heart. And for thy sake shed my heart's blood. What I have done and do for thee. 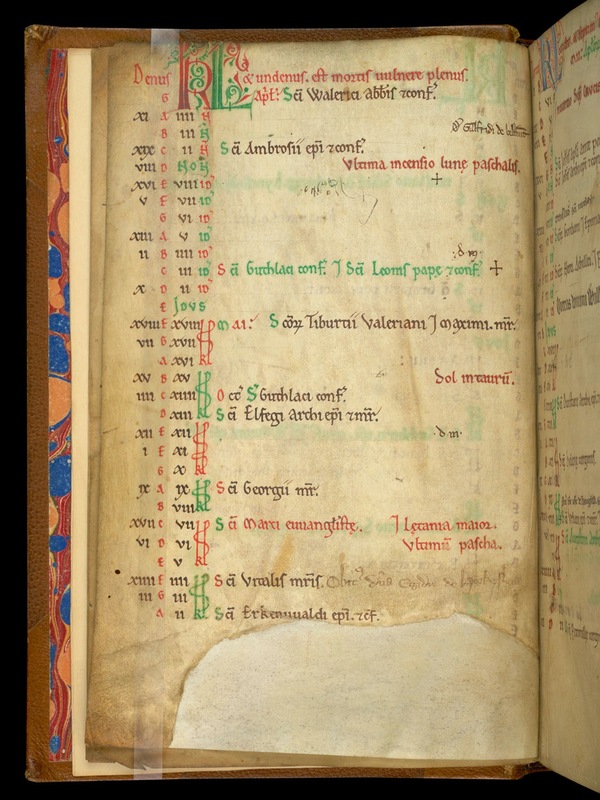 On the first of April, let's see how the month is described in the poem known as the Old English Menologium, which is becoming a regular feature on this blog. 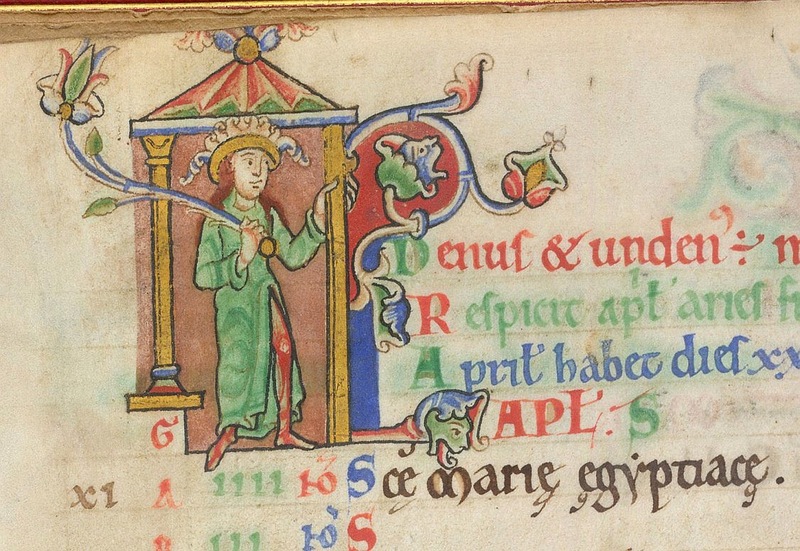 In case you need an extra excuse to read Old English right now (though I'm sure you don't), today is ‘Whan That Aprille Day’! eallum eorðwarum eadigum to blisse. 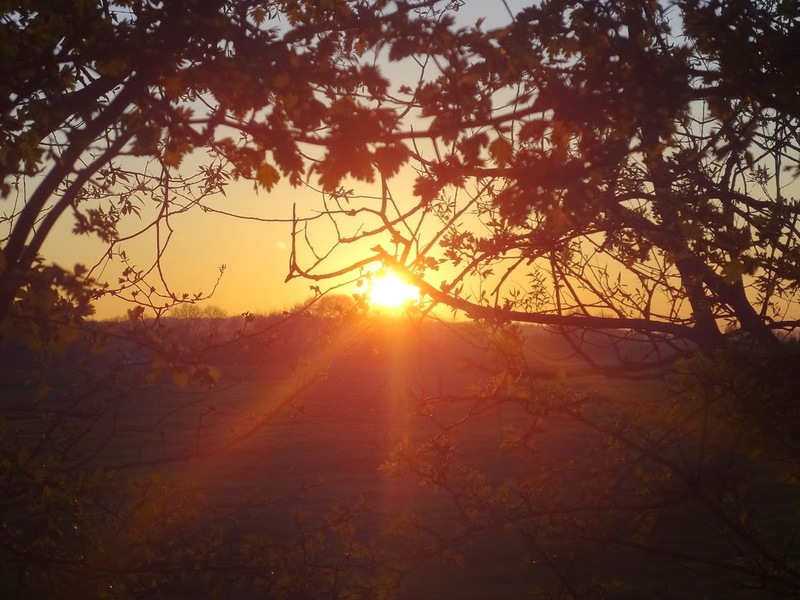 If I had to pick a favourite Old English word, from sound or meaning, eadig (happy, blessed) would be a strong contender; and it's particularly lovely that the triple alliteration in this line, eallum eorðwarum eadigum, suggests to the ear a fourth, unspoken word to complete the pattern: Easter. This text, like 'O man, whiche art the erthe take froo', comes from the fifteenth-century manuscript of poems collected by the Canterbury Franciscan James Ryman. In Ryman's collection, this poem is followed by another which has an English version of the same refrain: 'I do not desire the death of a sinner'. Of a synner he wille no deth. 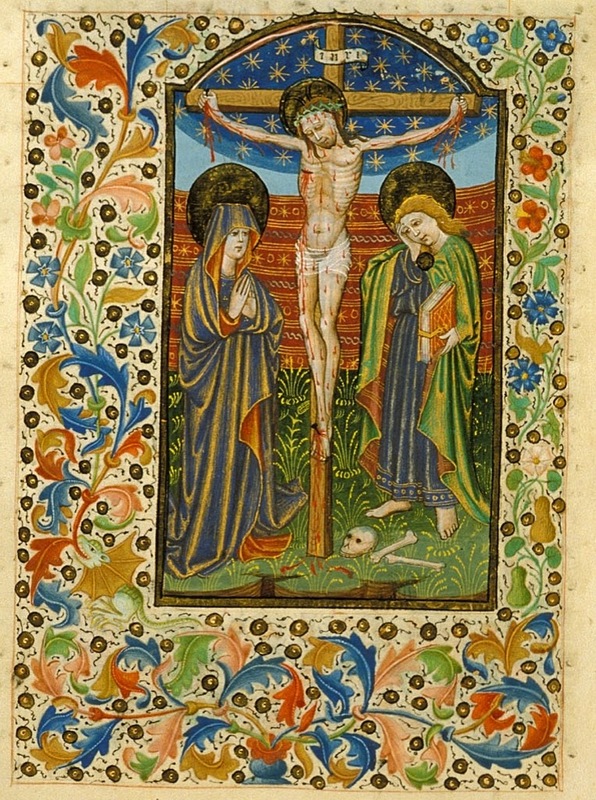 The refrain 'Nolo mortem peccatoris' may be familiar from a motet attributed to Thomas Morley, the text of which is also an English poem with a Latin refrain spoken in the voice of Christ; information on that text and its relationship to these poems can be found here. It was a popular refrain, appearing also in this poem by John Audelay and this in St John's College, Cambridge, MS S.54. Of a sinner he desires no death.